Men are from Planet Four? We do not ask our volunteers to tell us their gender when they create an account, but we can guess at gender based on comparing the identified genders of first names from the most recent US Census with the first names that (some) volunteers give us. In this graph we’re using only the names that are almost exclusively used by males or females. The graph shows the split in men and women taking part across all projects in the Zooniverse, from the birth of Galaxy Zoo in 2007 to the present day. The ratio used to be pretty strongly skewed, but nowadays it’s trending towards an even balance of men and women. Some caveats: obviously this dataset cannot include 100% of our volunteers, as not everyone in the Zooniverse gives us their publishable first name, and there are many names that aren’t exclusively identified with a single gender, and gender is not a strict binary anyway. 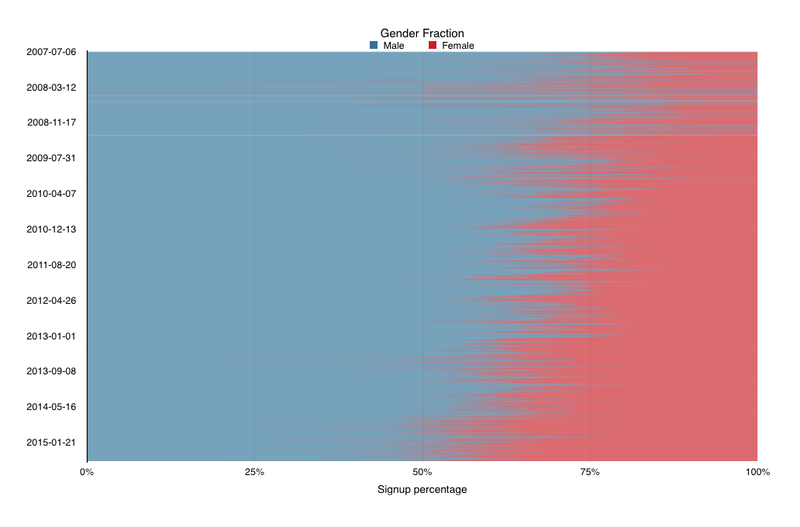 In a recent survey of a subset of Zooniverse users, 2% did not identify as female or male. Everyone is equally welcome in the Zooniverse, and while this figure doesn’t show the complete picture (it includes a bit less than half of our users), it at least hints that we’ve made some progress in bringing the gender balance of our community a little closer to the distribution of the overall population.